Looking for letters in New York City is different from looking for them in Rome, Paris and London and other European cities. Not only is New York’s history much shorter, but it is one of constant renewal as the old quickly makes way for the new. The rapid pace of construction and its attendant demolition has accelerated since 2001. It can be fairly said that New York is currently undergoing its most massive facelift since the 1920s and early 1930s. Consequently, not only is it difﬁcult—sometimes nigh impossible—to ﬁnd examples of lettering from the 18th and 19th centuries, but now it is getting increasingly harder to find it from the ﬁrst half of the 20th century. (The recent demolition of the Tunnel Garage is only the latest example of lost lettering.) Fortunately, the best lettering of the 1920s and 1930s—especially Art Deco and Art Moderne examples, but also numerous Gothic style ones—survive because it is often found on landmarked buildings, primarily the original skyscrapers that gave New York the progressive and jazzy image it still has. Here is a short list of some of the notable Art Deco and Art Moderne buildings in New York from the perspective of letter-lovers rather than architects. Some major works of architecture are missing because they either have little lettering of note (e.g. the Chrysler Building) or, surprisingly, none at all. There are also a number of buildings from the 1920s and 1930s that are a mixture of Art Deco and Gothic whose lettering is in the latter style (usually uncialesque). Examples of Gothic lettering will be the subject of a future look at New York’s lettering heritage. Without doubt the best single agglomeration of distinctive architectural lettering and decoration in New York is Rockefeller Center, the complex of buildings located between Fifth and Sixth Avenues from West 48th to West 51st Street that was constructed during the Great Depression. Norval White and Elliott Wilensky, authors of the standard AIA Guide to New York City (4th ed., 2000—but now sadly out-of-print) describe Rockefeller Center as “an island of architectural excellence… the greatest urban complex of the 20th century: an understated and urbane place that has become a classic lesson in the point and counterpoint of space, form, and circulation.” The original buildings were designed by Associated Architects—a collaboration among Reinhard & Hofmeister, Corbett, Harrison & MacMurray and Raymond Hood, Godley & Fouilhoux—between 1932 and 1940. Additional buildings were added to the complex between 1947 and 1973. There are many buildings at Rockefeller Center—as well as the sunken Rockefeller Plaza at its heart—that have lettering. The best of them are listed below. Although the complex was built in the 1930s not all of the lettering is in the Art Deco mode. 1. Rockefeller Plaza (between West 48th and West 50th Streets). THAT HATH PROVED TO MORTALS A MEANS TO MIGHTY ENDS. John D. Rockefeller Credo (1961). Design by Arnold Bank. Carving by Jim Casey and John E. Benson. I believe that thrift is essential to well-ordered living and that economy is a prime requisite of a sound ﬁnancial structure, whether in government, business, or personal affairs. 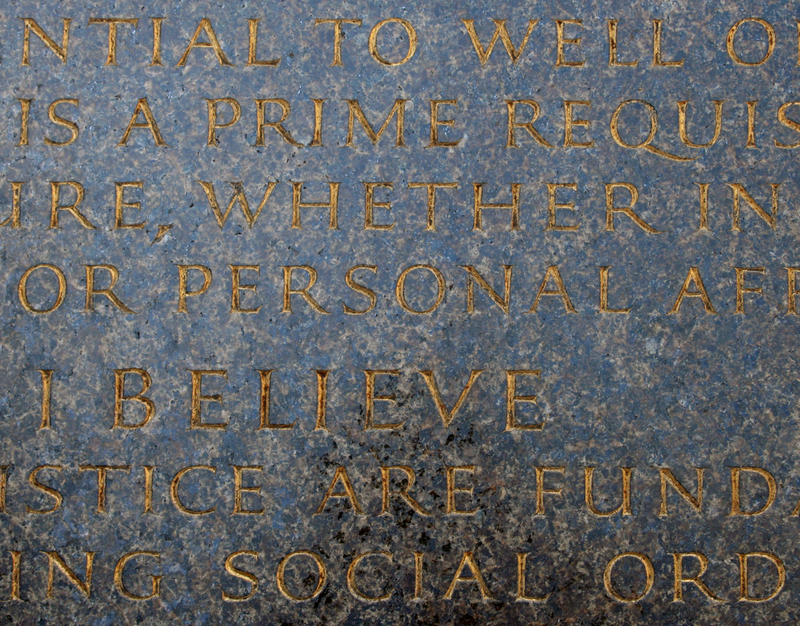 I believe that truth and justice are fundamental to an enduring social state. I believe in the sacredness of a promise, that a man’s word should be as good as his bond; that character—not wealth or power or position—is of supreme worth. I believe that the rendering of useful service is the common duty of mankind and that only in the purifying ﬁre of sacriﬁces is the dross of selﬁshness consumed and the greatness of the human soul set free. I believe in an all-wise and all-loving God, named by whatever name,\ and that the individual’s highest fulﬁlment, greatest happiness, and widest usefulness are to be found in living in harmony with His will. I believe that love alone is the greatest thing in the world; that it alone can overcome hate; that right can and will triumph over might. Wisdom, Light and Sound (1933) by Lee Lawrie. 2. The GE Building (formerly the RCA Building; Associated Architects, 1933) / 30 Rockefeller Plaza. The “campanile” of Rockefeller Center in the words of White and Wilensky, the GE Building houses the Rainbow Room and the studios of NBC. 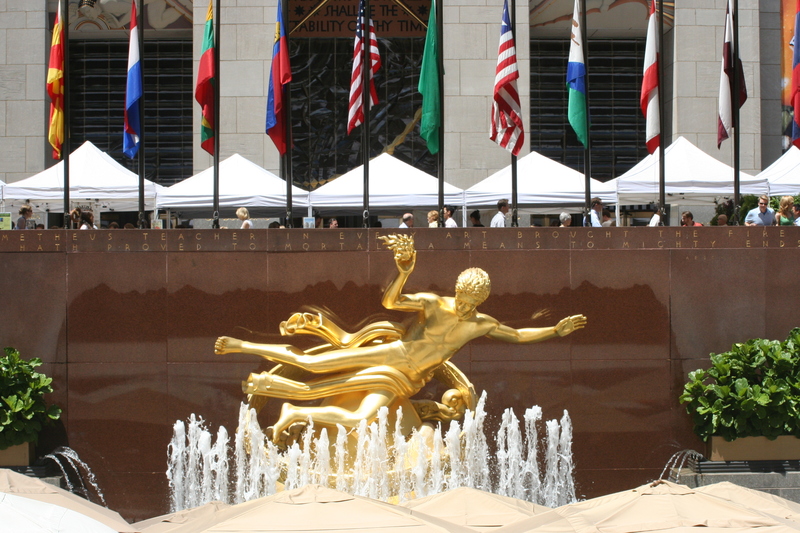 Its main entrance facing onto Rockefeller Plaza is dominated by Lee Lawrie’s colorful limestone and glass block sculpture “Wisdom, Light and Sound”. The bearded ﬁgure holding an open compass is highly reminiscent of Urizen, William Blake’s mythical character who personiﬁes reason, repression and authority. Below the compass is the text WISDOM AND KNOWLEDGE / SHALL BE THE / STABILITY OF THY TIMES. Despite their Blakean sound, the words are from Isaiah 33:6 (“And wisdom and knowledge shall be the stability of thy times, and strength of salvation: the fear of the LORD is his treasure.”). The black capitals are sans serif with a touch of Art Deco in the “escalator” Ss. Lawrie(1877–1963) is also responsible for the statue of Atlas (1937) on Fifth Avenue facing St. Patrick’s Cathedral. Inside the GE Building there are several large murals. “American Progress and Time”(1937) by José Maria Sert (1876–1945) covers the wall facing the main entrance as well as the ceiling overhead and the niches on either side of the entrance. It replaced “Man at the Crossroads Looking with Uncertainty but with Hope and High Vision to the Choosing of a Course Heading to a New and Better Future”, the mural by Diego Rivera that Rockefeller ordered destroyed before its completion because it included an image of Vladimir Lenin. 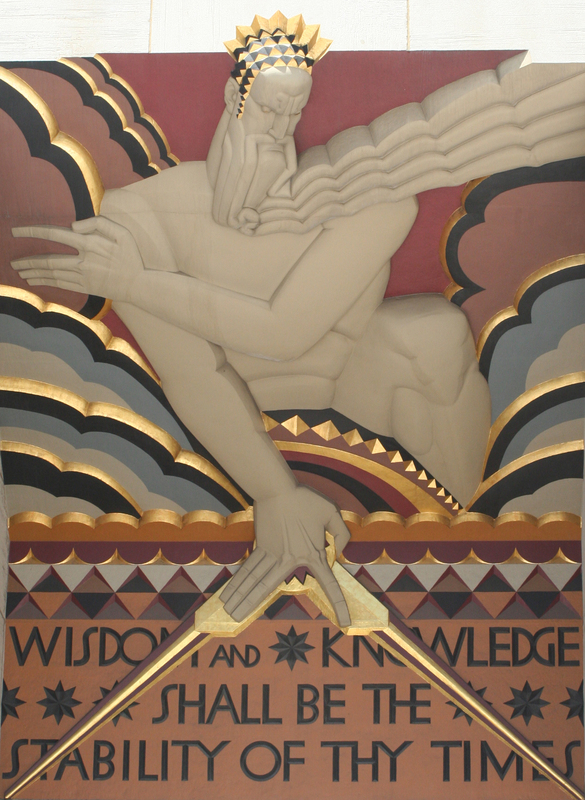 Another mural by Sert, “Man’s Intellectual Mastery of the Material Universe” (1934), graces the north corridor of the elevator bank while the south corridor has a mural by Frank Brangwyn (1867–1956), “Man’s Conquest of the Material World” (1934). The latter includes several lengthy texts in a blobby outlined style of capitals that is at odds with the Art Deco architecture. MAN LABOURING / PAINFULLY WITH / HIS OWN HANDS: / LIVING PRECARIOUSLY / AND ADVENTUROUSLY / WITH COURAGE / FORTITUDE / AND THE INDOMITABLE / WILL TO / SURVIVE. MAN THE / CREATOR AND / MASTER OF / THE TOOL. / STRENGTHENING / THE FOUNDATIONS / AND MULTIPLYING / THE COMFORTS OF / HIS ABIDING / PLACE. MAN THE MASTER AND / SERVANT OF THE MACHINE, / HARNESSING / TO HIS WILL THE / FORCES OF THE / MATERIAL WORLD, / MECHANISING / LABOUR AND / [the text wraps around the corner] ADDING / THESE TO / THE PROMISE / OF LEISURE. MAN’S / ULTIMATE DESTINY / DEPENDS NOT ON / WHETHER HE CAN / LEARN NEW LESSONS / OR MAKE NEW / DISCOVERIES AND / CONQUESTS, BUT ON / HIS ACCEPTANCE OF / THE LESSON TAUGHT / HIM CLOSE UPON / TWO THOUSAND / YEARS AGO. The metal lettering over the side exits onto West 49th and West 50th Streets is worth noting as are the numbers on the clock at the latter site. The sans serif letters and the numbers are terraced. Sugar (British Empire Building) (1934) by Carl Paul Jennewein. 3. The British Empire Building (Associated Architects, 1933) / 620 Fifth Avenue. Over the entrance to the British Empire Building is a bronze tribute to the “Industries of the British Commonwealth” (1934) by Carl Paul Jennewein (1890–1978). Nine allegorical ﬁgures represent various commodities. From left to right and top to bottom, they are Salt, Wheat, Wool; Coal, Fish, Cotton; and Tobacco, Fish (again), Sugar. Each is labeled in light, idiosyncratic sans serif letters that tumble about. Both the words and the figures are gilded, making a dramatic contrast to the rich black background. Above Jennewein’s sculptural relief is a the colorful Royal Coat of Arms of the United Kingdom with the motto “Dieu et Mon Droit” rendered in uncialesque versals. Beauté (La Maison Française) (1934) by Alfred Janniot. 4. La Maison Française (Associated Architects, 1933) / 610 Fifth Avenue. Across The Promenade is La Maison Française, the French counterpart to the British Empire Building. Above its entrance is “The Friendship of France and the United States” (1934), a gilded bronze bas-relief by Alfred Janniot (1889–1969). The sculpture consists of ﬁve women: the two above represent France and New York (not the United States despite the title of the work) while the three below embody Poetry, Beauty and Elegance. The lettering is a thin sans serif. The ﬁgure of Marianne, the symbol of France, is above Janniot’s sculpture. At her feet is the motto “Liberté, Egalité and Fraternité” in poorly spaced, light sans serif capitals. Radio City Music Hall (1932). 5. Radio City Music Hall (Edward Durell Stone, 1932) / Sixth Avenue and West 50th Street. Two theaters were originally built at Rockefeller Center. The only one remaining is Radio City Music Hall designed by Edward Durell Stone. The interior decor was coordinated by Donald Deskey. It includes artwork by Ezra Winter, Yasuo Kuniyoshi, Stuart Davis, Louis Bouche and Paul Manship. On the 50th Street side of the exterior are three large, polychrome, enameled metal roundels by Hildreth Meiere (1892–1961) honoring the “Spirits of Song, Drama and Dance” (1932). Radio City Music Hall has three movie marquees: a vertical one along Sixth Avenue and another at the corner of 50th Street; and a horizontal one that wraps around the building from Sixth Avenue to 50th Street. 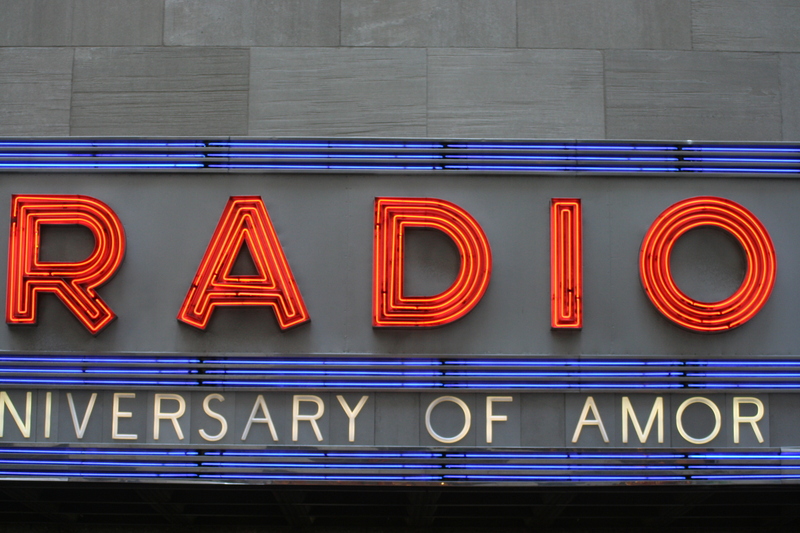 On all of them “Radio City” is rendered in blocky sans serif letters in red striped neon while “Music Hall” is yellow neon (script on the horizontal marquee and capitals on the vertical ones). 6. 640 Fifth Avenue building (Leonard Schultze & Associates, 1949) / 640 Fifth Avenue at West 51st Street. Across the street from The International Building at Rockefeller Center (630 Fifth Avenue) and kitty-corner from St. Patrick’s Cathedral is 640 Fifth Avenue. Although not part of Rockefeller Center, it was originally clad in compatible limestone. This was stripped away from the 11th to 18th floors in the 2004 modiﬁcation of the building undertaken by Kohn, Pederson & Fox for Vornado Realty. Three new floors with glass walls have been added. Fortunately, the entrance on West 51st Street is still largely intact. It is flanked by bas-reliefs representing various human activities and institutions. From top to bottom the left side has Religion, Government, Ex Libris, Transportation and Commerce while the right has Family, Science, Arts, Communications and Industry. Each of these emblems is captioned in sunken sans serif letters. Transportation is distinctive for its ligatures. Detail, Empire State Building map (1931). 7. Empire State Building (Shreve, Lamb & Harmon, 1931) / 350 Fifth Avenue at West 34th Street. The Empire State Building has been called New York’s lighthouse, a reassuring beacon at the center of Manhattan. It is famous for its views of the city, but it deserves to be famous as well for its lettering on view. 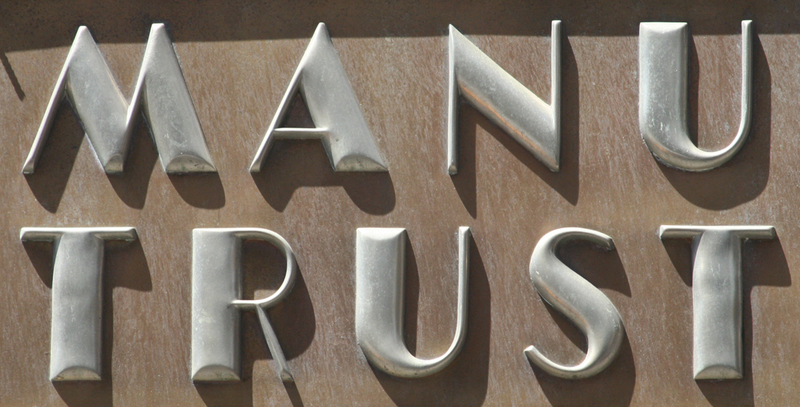 The name of the building, over the Fifth Avenue entrance, is carved in chunky, minimally-seriffed capitals with a corrugated interior texture that adds reflective variation to the gold leaﬁng. 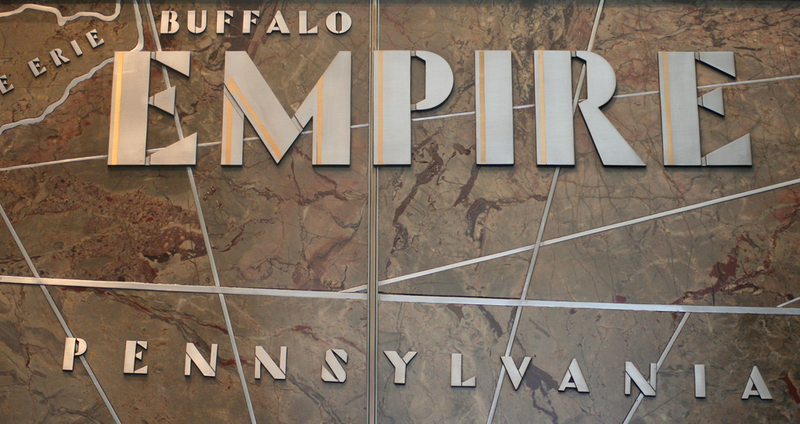 At the rear of the Fifth Avenue lobby, the Art Deco building has a stunning marble, aluminum and bronze relief of itself superimposed on a map of New York State (the “Empire State”). Key geographical place names are lettered in a distinctive stencilled planar form of Art Deco similar to the typefaces Futura Display and Braggadocio. (The larger aluminum letters have a decorative brass inline.) The same lettering style also appears on the Empire State Craftsmanship Awards plaque located in the corridor linking the Fifth Avenue lobby to the West 34th Street lobby. [Christian Schwartz used these lettering styles as the basis for a custom typeface for the building. See “‘Empire’ Strikes Back”, my Hot Type column in Print LXII:III (June 2008).] A set of eleven bronze medallions depicting crafts and industries (Masonry, Heating, Electricity, Machines, Concrete, Excavation, Plumbing, Steel, Carpentry, Decoration and Elevators) involved in the building’s construction—three over the Fifth Avenue entrance and the rest in the West 34th Street lobby—have non-Deco chubby seriffed roman capitals. The best of the medallions are those for Masonry with its bouquet of trowels and for Machinery with its mass of meshing gears. Detail of facade, Daily News Building (1930). 8. Daily News Building (Howells & Hood, 1930; addition, Harrison & Abramovitz, 1958) / 220 East 42nd Street between Second and Third Avenues. Architect Raymond Hood pioneered the idea of vertical striping—achieved by alternating patterned red and black brick spandrels and russet window shades with white brick piers—in his design of the Daily News Building. He intended the building to have a large window in front but for technical reasons had to abandon the idea. Instead, the projecting limestone entrance has a bas relief above it with THE NEWS cut away at the top in heavy bevelled sans serif letters, followed by the sun’s rays bursting forth from behind clouds and below the phrase “HE MADE SO MANY OF THEM” cut in an arc over a scene of working laborers and passing businessmen. (The phrase, lifted from an apocryphal quotation by Abraham Lincoln [“God must have loved the common people, he made so many of them”], was intended to reinforce the perception of the Daily News as the newspaper of the working man.) 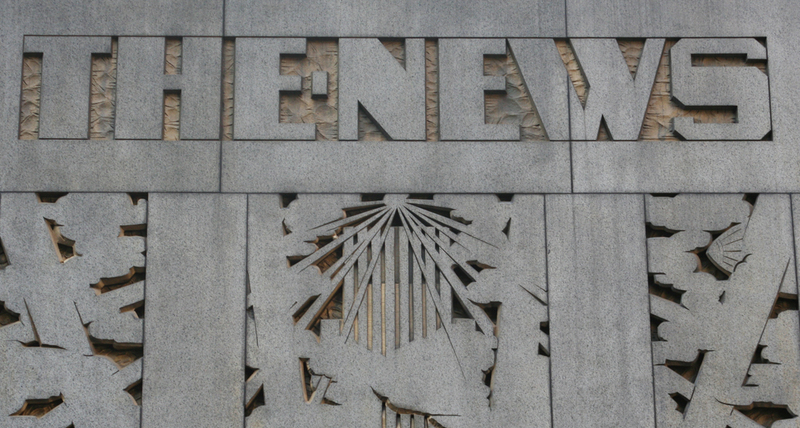 The lettering style used for THE NEWS is repeated in the illuminated THE · NEWS · BUILDING cut into bronze directly over the revolving doors. 9. Former McGraw-Hill Building (Hood, Colley & Fouilhoux, 1931) / 330 West 42nd Street between Eighth and Ninth Avenues. At the other end of 42nd Street Raymond Hood designed the McGraw-Hill Building (now the Group Health Insurance Building), often viewed as a key step in the transition from Art Deco to the International Style. Clad in eye-catching blue-green terra cotta the building was the ﬁrst to have horizontal ribbon windows. 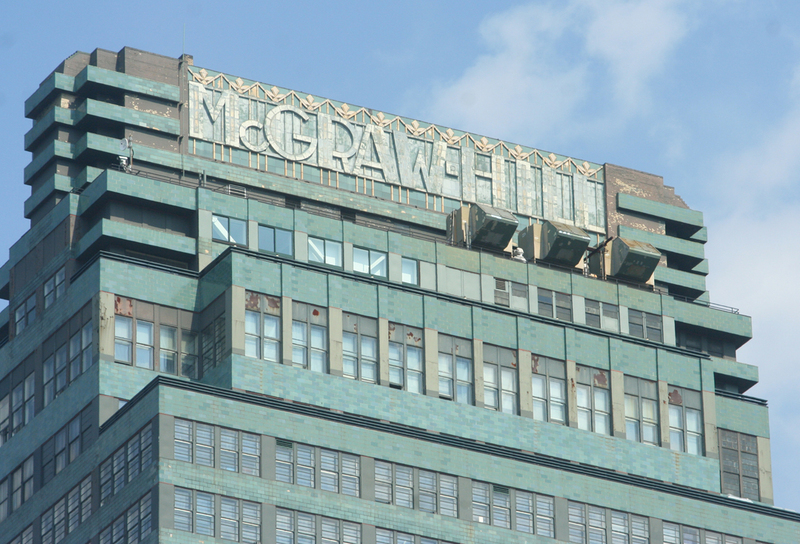 The lovely Art Deco nameplate over the front entrance is long gone (it survives in photographs from the 1930s), but not the 11 foot high letters spelling out McGRAW-HILL at the top of the building. These letters—only visible from selected side streets in the Garment District or Hell’s Kitchen—are in an Art Deco version of a Fat Face (like the typeface Broadway). Originally they were white with orange stripes but now they are merely the blue-green of the terra cotta. 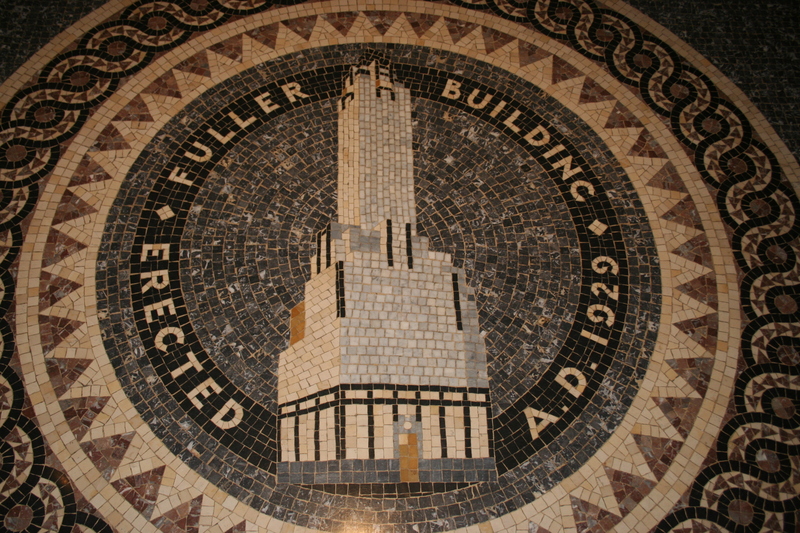 Mosaic rendering of Fuller Building in the lobby of the Fuller Building (1929). 10. Fuller Building (Walker & Gillette, 1929) / 41 East 57 Street at Madison Avenue. Detail of mailbox in lobby of 2 Park Avenue (1927). 11. 2 Park Avenue (Ely Jacques Kahn, 1927) / 2 Park Avenue between East 32nd and 33rd Streets. This building (whose ground floor is being vandalized in order to create larger, more commercially viable windows) is a disguised masterpiece. Its best Art Deco features are its multi-colored terra cotta roof decoration and its decorative lobby. 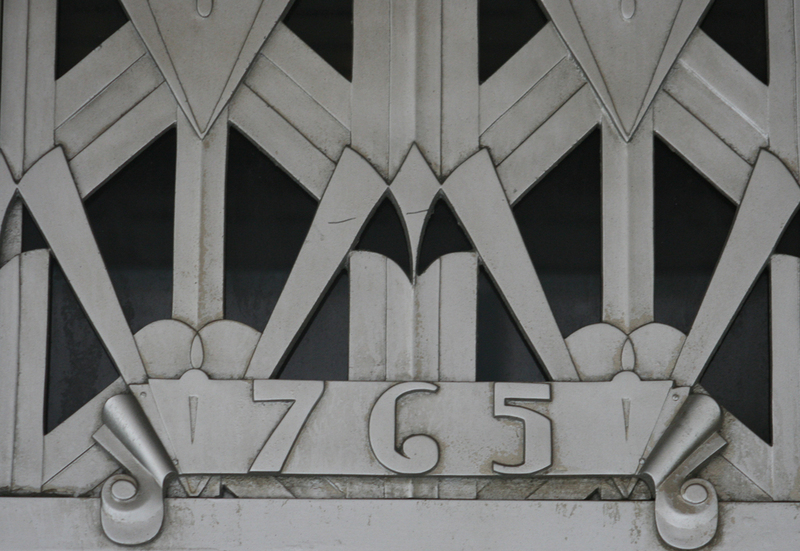 Like many office buildings of its era—not just the Art Deco ones—it has a wonderful letter box. 12. Chanin Building (Sloan & Robertson, 1929) / 122 East 42nd Street at the corner of Lexington Avenue to East 41st Street. One of the landmark Art Deco buildings in New York the Chanin Building is often overshadowed by the Chrysler Building, its neighbor across the street with the fantastic spire. The Chanin Building’s glories lie in its lobby (by Jacques Delamarre) and in exterior decorations. The latter are above the ﬁrst floor and thus often go unnoticed by passersby. But they include the marvelous bronze bas-relief by Edward Trumbell of an undersea world that runs around the facades. An authentic nameplate still survives at the 42nd Street entrance. Detail of Manufacturers Hanover Trust door at New Yorker Hotel (c.1930). 13. Manufacturers Hanover Trust Bank at the New Yorker Hotel / Seventh Avenue between West 34th and 35th Streets. Neither Manufacturers Bank nor Hanover Trust Bank nor their combined entity exists anywhere. And the branch ofﬁce formerly on the ground floor of The New Yorker Hotel survives only as an amazingly beautiful brass door topped by what appears to be aluminum letters, all in full Art Deco style. Who knows what glories the interior once held? 14. Bloomingdale’s / East 59th to 60th Streets between Lexington and Third Avenues (main building: 740 Lexington Avenue, Starrett & Van Vleck, 1930). This famous department store on the East Side is an amalgam of several Victorian and Art Deco buildings. Bloomingdale’s is of little interest architecturally but the facade and canopy on the Lexington Avenue side both have the store’s name in widely spaced Art Deco capitals and two of the doors on that side boast decorative address plates (743 and 765 Lexington Avenue respectively). The latter often go unnoticed amidst the throngs of shoppers and pedestrians. The store also has an incised script B at its entrances and in several places the Massimo Vignelli-designed logo from the 1970s (derived from Herbert Bayer’s Universal Alphabet) can be seen in various metals. 15. Former A.S. Beck Building / 128 West 34th Street. Across West 34th Street from Macy’s is a three story building currently housing Cliquers, a woman’s clothing store. However, at one time, it was an A.S. Beck shoe store. At the top of the white tile facade is A · S · BECK in large, sans serif ochre terra cotta letters above three ochre disks. The letters—like the seriffed ones that used to grace the Tunnel Garage—are built in segments. Date, New York City Department of Health Building (1933). 16. Former New York City Department of Health Building (Charles B. Meyers, 1935) / 125 Worth Street. 17. Former Beaux-Arts Institute of Design (Dennison & Hirons, 1928) / 304 East 44th Street. 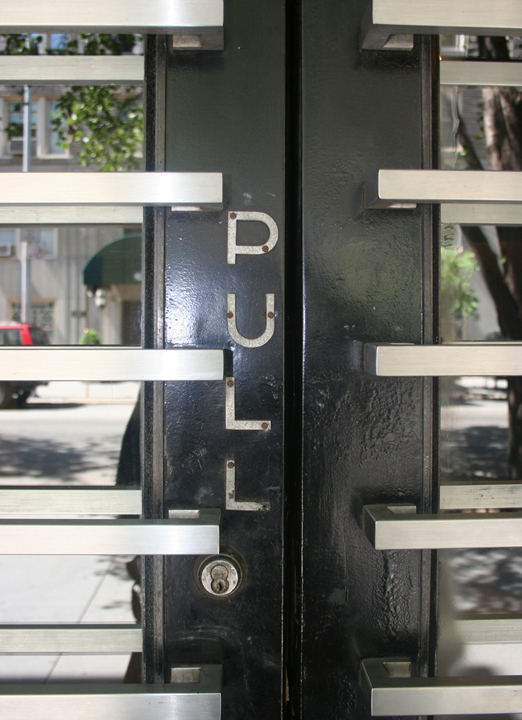 Detail of door, The New School for Social Research (1930). Bialystoker Center Home for the Aged (1930). 19. Bialystoker Center Home for the Aged (1930) / 228 East Broadway near Clinton Street. Detail of inscription, Community Church of New York (1940). 20. The Community Church of New York (Ralph C. Colyer & Maurice R. Salo, 1940) / 40 East 35th Street. The Community Church of New York (Unitarian Universalist), located just off of Park Avenue, is a streamlined modernist building in red brick. Its only decoration is a wonderful Art Deco sculpture by Moissaye Marans of Isaiah breaking a sword to make a ploughshare, emblematic of its congregation’s long history of liberal religious activism. 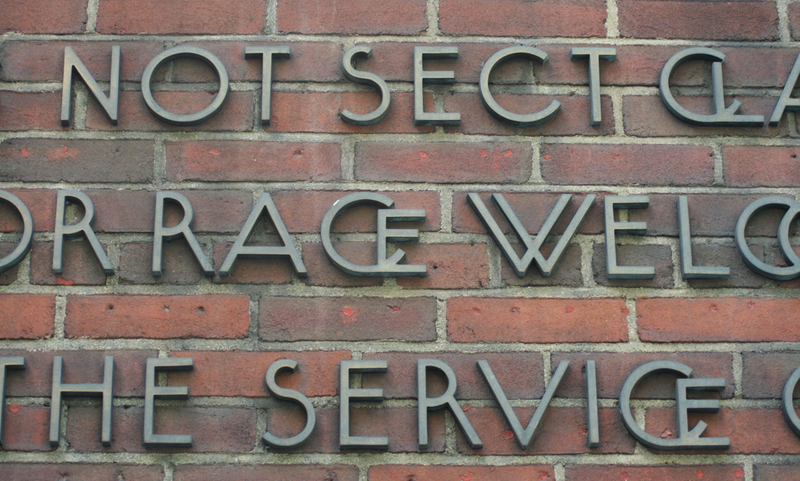 Below it are bronze letters afﬁxed to the brick identifying the church and its creed: KNOWING NOT SECT CLASS / NATION OR RACE WELCOMES / EACH TO THE SERVICE OF ALL. The letters are a thin Art Deco sans serif, many of them overlapping. A similar inscription but with more Art Deco tics (note the high crossbars of the A and E)—dating from 1971—is near the west door of the East 35th Street entrance. It reads: “BLESSED · ARE · THE · PEACEMAKERS” / IN · MEMORY · OF / EDWARD · AND · MARION · McVITTY. Women Entrance sign, Sunset Play Center (1936). 21. Sunset Play Center (Aymar Embury II, New York City Department of Parks & Recreation, 1936) / West side of Sunset Park (7th Avenue between 41st and 44th Streets), Brooklyn. During his tenure from 1934 to 1960 as New York City Parks Commissioner, Robert Moses oversaw an immense expansion of the city’s parks as he redeﬁned the idea of a public park to include zoos, skating rinks, boathouses, tennis courts, baseball diamonds, bridle paths, golf courses and swimming pools. The most famous (and grandiose) of these projects were carried out during the Depression with the help of an army of workers from the Works Progress Administration (WPA). One of them is Sunset Play Center in Brooklyn which has excellent Art Deco lettering for its restroom signs and admission desk. Detail, Dutch-American Friendship Memorial (H.A. Van den Eyden, 1926). 22. Netherlands Memorial (H.A. Van den Eyden, 1926) / north end of Battery Park. Near the Dutch-gabled entrance to the IRT no. 4 station at Bowling Green is a sculpted flagstaff pedestal erected in 1926 to commemorate three centuries of Dutch/American friendship. (The West India Company settled Fort Amsterdam in 1625 and the following year purchased Manhattan.) 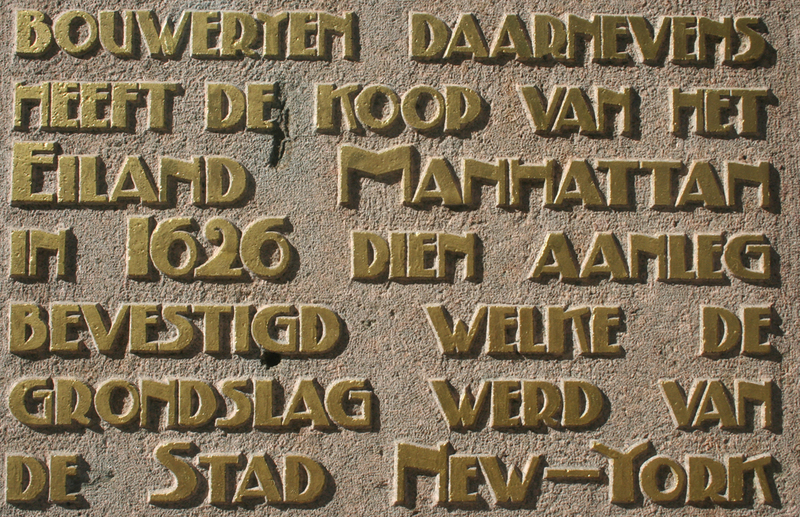 A text describing the history of New Amsterdam is in English on the northwest side and in Dutch on the southeast side; and on the southwest side is a high relief sculpture of a Dutchman handing a string of beads to an Indian above the text explaining the gift of the memorial from the Dutch people to the City of New York. The raised and gilded lettering is similar in style to the work of Michel de Klerk and the Amsterdam School of architecture. There is nothing else like it in New York City. The Green Park. Alternative entrance to 7 Park Avenue (1931). 23. Apartment Names. Given the importance of the apartment building to life in New York City it is not surprising that so many of them—from snooty Park Avenue high-rises to lowly tenements—bear names, especially if they are pre-World War II stock. The names on the tenements and other modest buildings tend to be in 19th century grotesques or Egyptians while the fancier addresses often have classical roman capitals and, sometimes, more decorative letters. Not many have Art Deco or modernist nameplates. 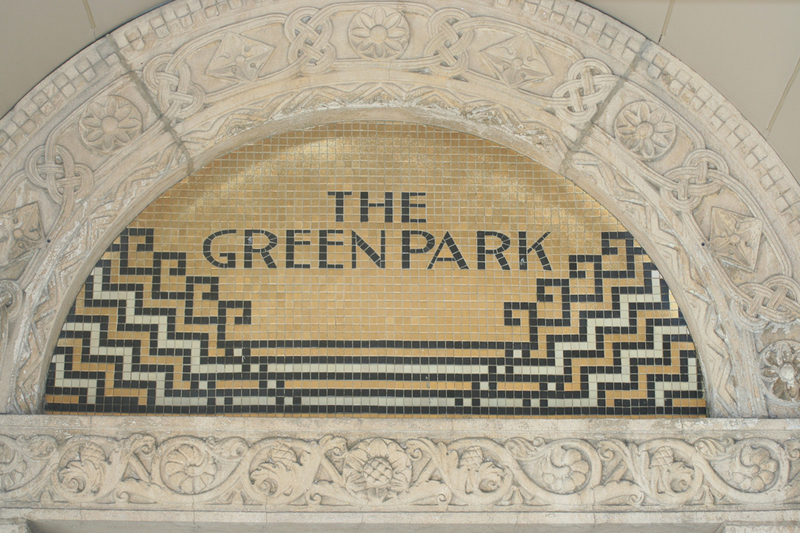 A notable exception is the 34th Street entrance to 7 Park Avenue with stylish black letters on a gold ground executed in mosaic tiles. A contrast is the modest apartment building at 73 Lexington Avenue whose address is hidden on the north end of a subtly angled Art Moderne canopy.